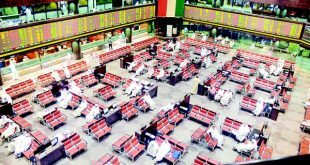 KUWAIT CITY, Jan 23: Kuwait bourse’s bull run slowed on Monday amid moderate profit taking. The price index climbed 37.84 pts in volatile trade to 6679.62 pts even as the liquidity breached the 1000 million mark for the first time since May, 2013. The KSX 15 benchmark rose 7.9 pts to 977.76 points while weighted index was up 3.4 pts at 422.34 points. The volume turnover meanwhile surged further helped by a spurt in speculative trading in select counters. 1,037.57 million shares changed hands – a 16.3 pct rise from Sunday. The sectors closed mostly in the green. Technology outshone the rest with 3.86 percent gain whereas telecommunications shed 1.55 pct, the biggest loser of the day. In terms of volume, financial services notched the highest market share of 39.2 percent and real estate followed with 31.6 pct contribution. In the individual shares, National Bank of Kuwait rallied 20 fils on back of over 7 million shares to close at 710 fils even as the bank kicked off the earnings season to log a modest rise in annual profits. KIPCO was up 10 fils at 550 fils extending an identical rise in the previous session. Zain fell 10 fils to 480 fils partly reversing Sunday’s gain while Wataniya Telecom (VIVA) jumped 60 fils. Kuwiat Telecommunications Co (VIVA) shed 20 fils and logistics major Agility rallied 40 fils to 730 fils. Kuwait Finance House vacillated in a narrow range before closing flat at 610 fils and Gulf Bank of Kuwait was up 10 fils at 290 fils. The bank has recorded a net profit of KD 32.80 million and earnings per share of 11 fils in the Jan-Sept period. The market got off to a solid start but fell sharply in early trade amid a brief bout of profit taking. The main index plumbed the day’s lowest level of 6608.55 pts before bouncing back on renewed buying. It peaked at 6,730.51 pts past the mid-session and gave some of the gains at close. Top gainer of the day, Mowasat Hospital Co spiked 10 percent to 275 fils and Sanam Real Estate Co rallied 9 pct to stand next, NSH slumped 8.33 percent, the steepest decliner of the day and Abyaar topped the volume with 85.8 million shares. Despite the day’s gains, the losers outnumbered the winners. 58 stocks advanced whereas 62 closed lower. Of the 150 counters active on Monday, 30 closed flat. 16,063 deals worth KD 97 mln were transacted – a 2,9 pct rise in value from the day before. National Industries Group was unchanged at 150 fils after trading 12,4 million shares whereas Gulf Cable slipped 5 fils to 465 fils. Heavy Engineering Industries and Shipbuilding Co added 4 fils while Contracting and Marine Services Co inched 1 fil, lower. Kuwait Food Co (Americana) paused at KD 2.600 and UPAC zoomed 50 fils to 830 fils with razor thin trading. Jazeera Airways dropped 20 fils to 660 fils and ALAFCO stood pat at 248 fls. NAPESCO gained 20 fils. Kuwait Portland Cement Co was flat at 980 fils and Kuwait Cement Co fell 5 fils to 435 fils. ACICO climbed 15 fils to 310 fils and NICBM took in 2 fils before settling at 216 fils. Humansoft Holding Co stagnated at KD 2.960 and Qurain Petrochemical Industries Co climbed 15 fils to 300 fils. The company has registered a net profit of KD 10,487,657 and earnings per share of 10.08 fils in the January-September period. Kuwait Foundry Co eased 2 fils and Yiaco Medical Co stalled at 270 fils. Equipment Holding Co edged 1 fil up and KCPC was up 8 fils before settling at 196 fils. Mezzan Holding Co rose 0 fils to KD 0.970 and Zimah Holding gave up 3 fil to wind up at 60 fils. Kuwait and Gulf Link Transport Co stood pat at 70 fils and KGL Logistics inched 1 fil lower with brisk trading. In the banking sector, Kuwait Finance House and Burgan Bank were flat at 610 fils and 340 fils respectively whereas Ahli United Bank was down 5 fils at 425 fils. Al Ahli Bank stagnated at 330 fils off slight early lows and Boubyan Bank followed suit. Warba Bank gave up 6 fils after trading 5.5 million shares whereas Commercial Bank of Kuwait was not traded during the session. National Investment Co and Kuwait Investment Co fell 2 fils each whereas International Financial Advisors added 3 fils on back of 17.6 mln shares. Commercial Facilities Co stood pat at 180 fils and Al Mal followed suit. Kuwait Financial Centre (Markaz) eased 2 fils to 102 fils whereas Osoul Investment Co was up 4 fils at 67 fils. KMEFIC inched 0.5 fils to 34.5 fils whereas Bayan Investment Co paused at 61 fils after trading 16.7 million shares. KAMCO fell 2 fils to 90 fils and KFIC rose 4 fils. Sokouk Holding and Aayan dialed up 3 fils each whereas Noor Financial Investment Co gave up 3 fils. Tamdeen Investment Co was down 5 fils at 265 fils. Kuwait Real Estate Co and United Real Estate Co clipped 2 fils each while National Real Estate Co slipped 4 fils to 128 fils after trading over 17 million shares. Mazaya Holding Co closed 2 fils lower. The market has been buoyant so far during the week and has soared 244 pts in last two sessions. It has leapt 931 points from start of the month after gaining 2.37 pct during whole of 2016. KSE, with 208 listed companies, is the second largest bourse in the region. In the bourse related news, Shuaiba Industrial Co has recorded a net profit of KD 1.66 million and earnings per share of 20.94 fils in 2016, 9m up from net profit of KD 1.33 mln and earnings per share of 16.83 fils in same period of 2015. Aqar Real Estate Investments Co. has registered a net profit of KD 923,223 and earnings per share of 4.34 fils in the January-September period down from net profit of KD 1.72 million and EPS of 7.63 fils in the 9m of 2015. Jeeran Holding Co. has logged a net profit of KD 431,750 and earnings per share of 3.17 fils in the first nine-month of 2016 up sharply from net profit of KD 177,518 and earnings per share of 1.30 fils in the 9m of 2015. Kuwait Building Materials Mfg. has registered a net profit of KD 159,204 and earnings per share of 5.3 fils in the January-September period as against net profit of KD 363,059 and earnings per share of 12 fils in the same period last year. Hilal Cement Company has logged a net loss of KD 3,709 and loss per share of 0.04 fil in the January-September period of 2016 narrowing from a net loss of KD 117,151 and LPS of 1.39 fils in same period in 2015.